Would you like that nice pile of beads shown at the top of this post? Just leave me a comment below and you'll automatically be entered to win. If you tweet or post on Facebook or other social spots about the contest, you can leave a second comment and be entered twice! I have tweeted about the giveaway @ccreechstudio Thanks for the second opportunity to win! I would love a chance to win these beads. I love green/recycled/reused items and these look wonderful to use. Thanks for the opportunity. Just tweeted about these great nuts and your giveaway. I love these beads. I'd love to win these fabulous beads - thanks for the chance! These beads are great but the fact that they are renewable is awesome. Makes them that much more special. Thanks for the chance to win. I love stringing & jewelry making and also try to live a 'green' lifestyle. These beads are perfect being renewable! And they are great looking! Is this open to international readers as well? I really hope so! Hi! I just posted your GiveAway on my blog too! I would love to win these beads. I tweeted and facebooked this contest, too. I would certainly love to enrich my bead stash with such beautiful beads! Thank you for the opportunity Cyndi. What a great giveaway! Thanks for the opportunity to win these wonderful beads! I've always loved these nut beads but I've never found any to play with. I'd love to play! Awesome! First time I've seen these beads. These are such beautiful beads and the idea behind them. Thanks for such wonderful giveaways! I just shared your post on facebook! Congrats to whoever ends up winning these! Great giveaway! The beads are beautiful! I would love to use these in my fiber worked necklaces. I love your site. i love the colours and shapes. thanks for the giveaway! I have never worked with the Tagua Nuts before but they look great. What neat BEADS! I would love to give them a new home. i LOVE THE BEADS! bEAUTIFIL! Would love for a chance to win the beautiful beads! Thank you! Lovely beads! I would be thrilled to win, thanks! Oh would I love to win these. I am getting kinda tired of the same-old beads and could use a change of GOOD pace. These are great looking beads. Thanks for the chance to win them! I would love to win some! Love these beads and the color palette. And a renewable resource. What else could you ask for? Yummy! 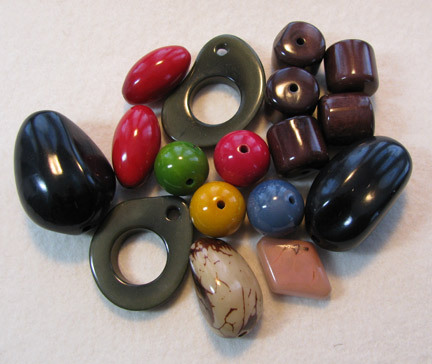 what a wonderful collection of beads, I love the idea of using Tagua beads because they are so versatile. Beautiful beads. Looove them. I am going to write about this giveaway in my blog and face book! I have planned to try these in my design.But did not get them yet.This was a good reminder. Fabulous beads! I have a couple of tagua beads from a local bead shop, and they just FEEL so nice in hand. I'd love to give these a nice home, too. I can feel my creative juices beginning to flow already! Thank you for making them available. These are beautiful, 'would love to win, thanks for the opportunity.